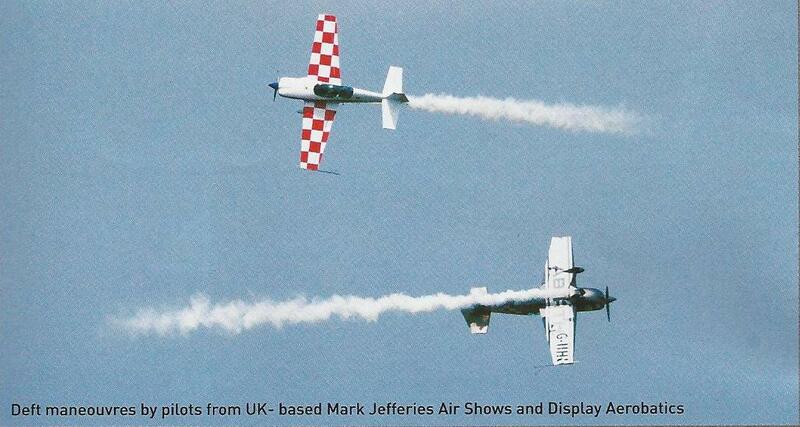 The new aerobatic air displays team formed by Mark Jefferies with Tom Cassells as his wingman – The Global Stars. Mark and Tom have been competing against each other for years in the British Aerobatic Association Championships – regularly exchanging the British Aerobatic Championship between themselves. Mark has won the championship 9 times, often at the Advanced, Unlimited Freestyle level. Tom has enjoyed huge success too and now flies his Cap alongside Mark’s Extra 330sc… probably the most skilled and experienced aerobatic display team in Europe. The air display season is nearly over with only a few air shows left to do – Santa Pod and Silverstone being the last major shows this year. Then the team will start training and preparing for the 2012 air show season.